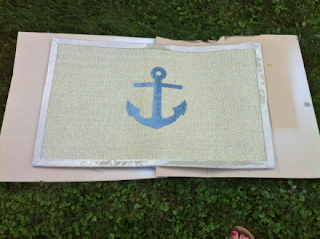 Today Callie from Callico Designs is showing you how to make your own anchor doormat! 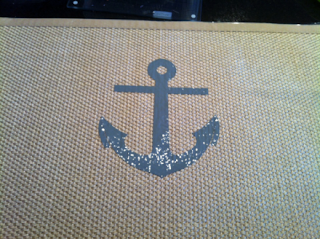 Nautical and beach themes tend to be high on my design list. I grew up spending every weekend of summer out on the boat with my parents…so naturally I love nautical. As mentioned in this post, I would love love love to have a beach house…some day. 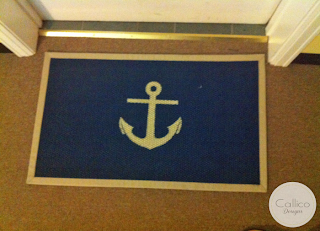 I have been on the search for a new doormat for quite some time now…why is it so hard to find a nice looking doormat that is not corny or boring? I have an inside door in my condo building (we have 8 condos, 4 downstairs and 4 upstairs), so it is not that important for it to be rugged enough to handle the harsh weather Vermont winters bring. 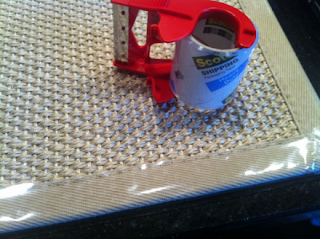 I bought a small, plain, 100% Sisal rug from T.J.Maxx for $9.99. Here is what it looked like…boring!! I used my Silhouette Cameo (you could probably cut out sticker paper too) to cut out an Anchor in vinyl. I then stuck the vinyl onto the rug. I decided that I wanted some more of the natural color to stay in the rug to balance out the blue, so I taped off the edges with some packing tape I had laying around (I would’ve used painters tape if I wasn’t too lazy to go find it in the basement). 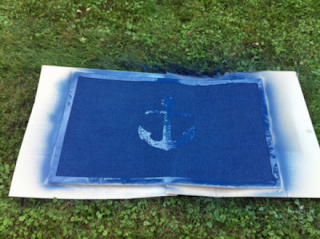 Finally I brought the rug outside and put it on top of 2 pieces of cardboard for painting. 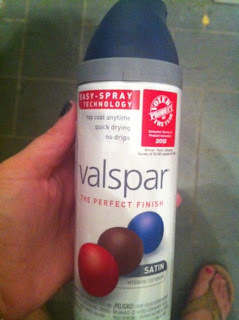 I used Velspar’s Satin indoor/outdoor paint in Indigo Steamer. Finally, I waited a few hours…then removed the vinyl decal and the tape around the outside. This is how she turned out! I’m in love! Now, I am thinking about all the other designs I can do! 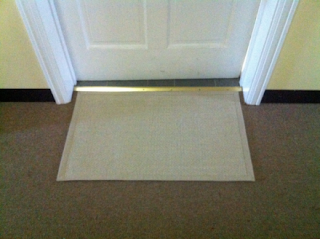 Have any of you ever done a DIY door mat? Have you ever painted a rug before? I am tempted to go bigger on the next rug project! Wow genius idea! I might need to try this! THis turned out great!! What a cute idea! Wow, that looks awesome! 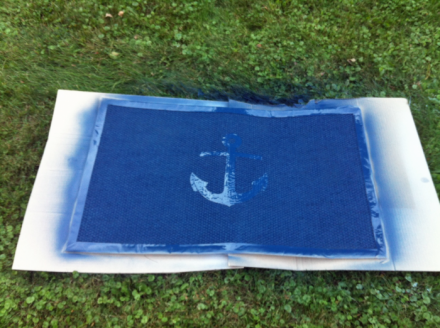 I did a DIY doormat where you spray paint a plastic one neon, and it turned out pretty cute! This is absolutely adorable…not to mention it seems pretty do-able for DIY projects. 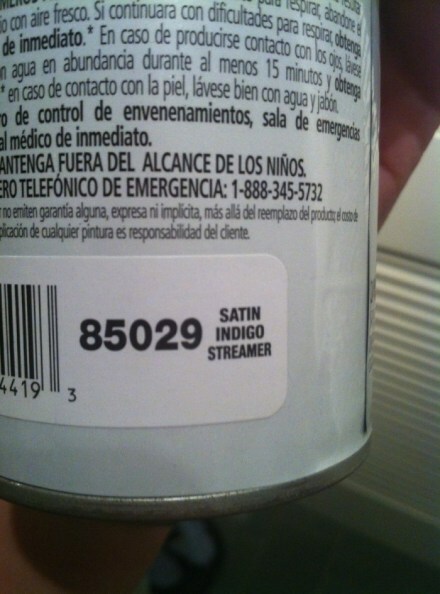 I'd love to hear how this holds up after some wear and tear. I'll definitely have Callie give an update in a few months! i love it!! a "do-able" craft for sure! That turned out so cute! Good job, Kate! I hope you had a great birthday! Miss you! This is awesome! I want to try it! Looks amazing! I've never tried doing anything like that, but if it is really that easy and turns out so nicely, I may have to give it a try!